Boracay is a ten square miles island right in the heart of the tropical-exotic Philippine archipelago, an hour's flight south of Manila. Travelers from all over the world can enjoy Boracay´s magnificent White Beach, excellent infrastructure, many leisure activities and extensive shopping. A wide selection of international cuisine and an exciting nightlife awaits Boracay vacationers. Boracay is an intergral part of the Visayas island group and belongs to Malay municipality, Province of Aklan. The Island of Boracay is located about 300 km (186 miles) south of Manila, 1 km northwest of Panay Island and in 10 minutes distance to Caticlan Jetty Port by boat. 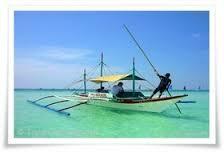 It is surrounded by the deep blue water of the Sulu Sea westwards and the Sibuyan Sea in the east. These warm and clear waters around Boracay are awesome for swimming, snorkeling and scuba diving. Tablas Island and Carabao Island (Hambil) are only a short boat ride away and can easily be seen during the vacation in Boracay. Boracay is one of altogether 7,107 tropical islands in the Philippine archipelago. The isle is 7 km (4.35 miles) long, 1 to 4 km (2.4 miles) wide and divided into three Barangayas (communities). Yapak in the north, Balabag in the center and Manoc Manoc in the south. The local time on Boracay is UTC/GMT +8 hours. Daily sunrise in Boracay is around 6:00am. 12 hours later, the sun sets behind the horizon. Despite the relatively small size of Boracay it has much to offer. Boracay hotels comprise a wide selection of 1-5 star accommodation. Most hotels, resorts and guest houses are within a stone's throw to White Beach or Bulabog Beach. Thus, in March 2014, Boracay's White Beach with its crystal clear water and fine white sand has been chosen by user of TripAdvisor as the No.1 Beach in Asia. The two main and largest beaches in Boracay are White Beach in the west and Bulabog Beach in the east of the island. The beach side of Bulabog is popular with kite boarding and windsurfing freaks. Meanwhile, visitors at famous White Beach finding excellent conditions for swimming and snorkeling in shallow water. Boracay offers many opportunities to practice water sport activities. The vast majority of service providers in that range are located along White Beach and Bulabog Beach. Unfortunately, algae bloom may occur at the west coast of Boracay in the dry season between December and May. 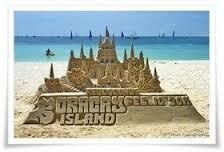 About 12000 local residents most of them Catholic Christians are living in Boracay. The majority speaks the Filipino language Tagalog many also fluent English. The official national language in the Philippines is Filipino that is largely based on Tagalog. Residents in Boracay live primarily on tourism, which is the main source of income since the eighties. From a health point of view Boracay Island is basically harmless. But the geographical location of tropical Boracay and the intense sun radiation has to be taken into account. Drinking plenty of water and consistent skin protection avoids dehydration and sunburn. Tap water should not be drunk in Boracay. Bottled drinking water can be bought everywhere for reasonable prices. Boracay Island Hospital, Metropolitan Doctor´s Medical Clinic, Island Clinic Boracay and the Diagnostic Center. Hospitals in Kalibo, Iloilo or Manila provide care and treatment for those with serious injuries and illnesses. Certain vaccinations are not recommended, when traveling to Boracay. It´s common in the Philippines, that patients pay for their medical treatment on the spot in cash or by credit card. The Tourist Center Boracay is located at the beginning of Boat Station 3 directly on White Beach. A variety of services are being offered here. E.g. : postal matters, telegram and fax services; safe deposit boxes, money transfer with Western Union, internet, and basic shopping options. The Tourist Center includes a travel agency where flights can be booked departing from Caticlan or Kalibo Airport within the Philippines or to other countries in Southeast Asia. In 2018, Boracay Island was closed 6 months for tourism. Renovation work was carried out, especially on the sewerage system, which had become obsolete and inadequate. Note: Littering, smoking, drinking and dining are prohibited on White Beach. It is punishable by a fine of 1000 PHP or imprisonment.